Barring any kind of re-injury to his jaw during training, WBO lightweight champion Ricky Burns (36-2-1, 11 KO’s) will be back in the ring on March 1st against his mandatory challenger from America Terence Crawford (22-0, 16 KO’s) in a fight at the Scottish Exhibition Centre, in Glasgow, Scotland, United Kingdom. Burns is being pushed into this fight by the World Boxing Organization after they ordered the fight to take place next. 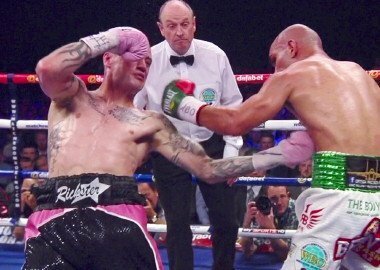 Burns wanted to fight a rematch against Raymundo Beltran to clear up the mess from their fight last September that ended in a 12 round draw in Glasgow. Many fans thought Beltran had done enough to get the win, but the judges had it as a draw. Burns suffered a broken jaw in the fight, and he really couldn’t do a lot after the 2nd round due to the pain. He feels that without that injury happening he would have beaten Beltran in a convincing manner. Burns has not looked like his old self in his last two fights against Beltran and Jose Gonzalez. Some fans think Burns isn’t the same fighter that he once was now that he’s 30. But if you look at what’s changed recently with his career you’ll notice that it was the level of competition rather than anything to do with him wearing down. Burns had been beating guys like Kevin Mitchell, Michael Katsidis, Paulus Moses and Nicky Cook. He went from beating those guys to all of a sudden fighting Jose Gonzalez and Beltran. Burns didn’t look ready for the improvement in competition, and that’s probably the biggest reason for his problems in his last two fights. Crawford is a different kind of fighter than the other guys that Burns has fought in the past. He’s not going to give Burns a lot of opportunities to land shots, and he’ll be sure to make him pay when he tries to land his own punches. Burns will need to try and figure out a way to solve Crawford’s difficult style because so far no one has done it.